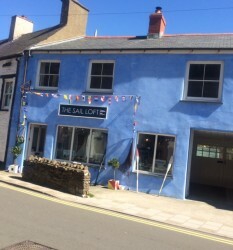 The Sail Loft is home to Simon Swinfield’s watercolours which capture the essence of Pembrokeshire’s se & sky. Alongside his prints & originals we have elegant ceramics, hand-blown glass, beautiful jewellery, watches, wood carvings of the local wildlife alongside gifts echoing the coastal setting. Beautiful things you won’t find everywhere.